For being located in the heart of the Dallas-Fort Worth Metroplex, the fourth-largest and fastest growing Metroplex in the United States, Fort Worth is unique in that the old western charm of Texas days past have been preserved. This is one of a few Texas cities that truly offers a little bit of everything. Even in this large modern city, one cannot forget they are in Texas. 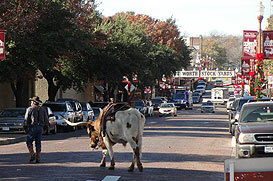 Fort Worth is home to the Stockyards National Historic District and without boots and a 10-gallon hat, one may feel out of place. The brick roads are lined with storefronts that appear to be taken right out of a western movie, and right around the corner the Stockyards, which hosts rodeos throughout the year and two daily cattle drives. The modern movement has not left Fort Worth behind though. Sundance Square, the new downtown, is a fun destination for great food, live music, and the arts. And for the outdoor enthusiast, Fort Worth is home to the beautiful 110-acre Botanical Gardens, and the city has also developed trails along the Trinity River. The city of Fort Worth has developed into a very well-rounded city offering something for everyone.